Ever wanted to see if you really had activity in your brain? I know, sometimes your friends might wonder. But you do. The U.S. Archery Team uses brain activity to track their team’s focus and relaxation levels. You can use it to fly a helicopter (okay it is just a toy helicopter). You are probably thinking — hey I would like to be able to do that and actually convince my friends I have brain activity. Well, you can. Just buy a brain-computer interface and connect it to your computer or smartphone. You may be thinking that sounds a bit complicated. Not really. You can do it yourself. 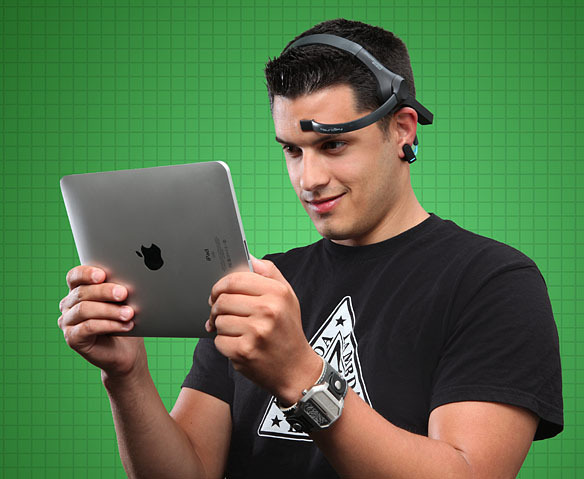 Just buy a NeuroSky MindWave Mobile headset (see image below) and download some apps from NeuroSky’s store and start proving your friends wrong! Katie Dickerson (Computer Applications & Poverty Studies) has been testing out the NeuroSky MindWave Mobile headset for us with the Puzzlebox Orbit helicopter. She has found the helicopter to be a bit hard to control. Not because she doesn’t have any brain activity! Quite the contrary. She is having a hard time using the controls on the app to maneuver the helicopter. She can get the helicopter to go up and down, but she just can’t get it to go anywhere else. I’m sure it is just a matter of time until she gets that figured out. We plan to use the headset to research how well the device can help people to focus. Think of students and homework. Employees and projects. Faculty and their research. You get the idea. Anyway, stay tuned to our blog for an update of our research on the headset. We hope to have something more to report back to you by the end of spring semester (maybe some pictures of Katie flying the Orbit too!). This entry was posted in Presentations, Testing, Uncategorized and tagged brain, eeg, mindwave, Mobile, neurosky, orbit by Kevin. Bookmark the permalink.